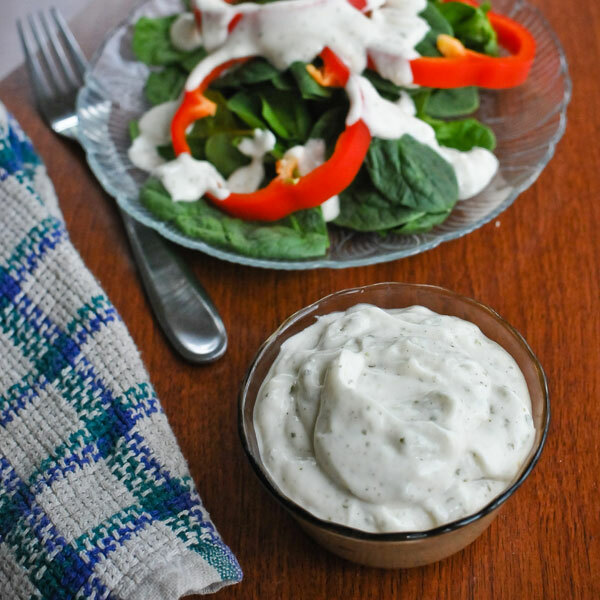 Creamy, delicious ranch dressing with no egg, dairy or sugar! Be sure to add this to your saved recipes and try it on your next salad. More to the point, I’ve known many people who looooove it – they put it on salads, dip fries in it, put it on vegetables, I don’t even know what all they come up with to do with it. Those people, if they have become vegan or can’t eat eggs or dairy…they’re gonna like this post. Personally I’ve always liked it fine but never been obsessed with it. 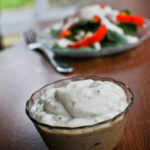 But I was pretty excited to figure out how easy (and cheap) it is to make your own vegan ranch dressing at home! I haven’t tried buying a commercial vegan version (is there one? I’d think so but haven’t looked), but this tastes a heck of a lot like the regular ranch dressing I remember, and it’s cheaper than almost any brand I’ve seen, vegan or not. 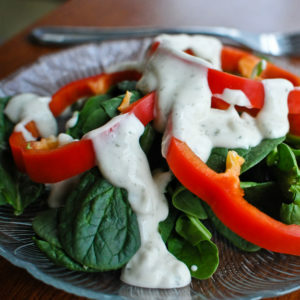 Run the processor for maybe 10-15 seconds and, woo hoo, you will have a nice creamy dressing – it may be perfect ranch consistency right out the gate, or you may want to add a splash of soy milk to thin it out. Then toss in some powdered garlic and onion (I normally prefer to use both of those things fresh, but in this application you probably will get better results from powdered for consistency purposes), a bit of lemon juice, some salt and pepper, and some dried parsley (you could probably use fresh parsley, if you minced it really fine). 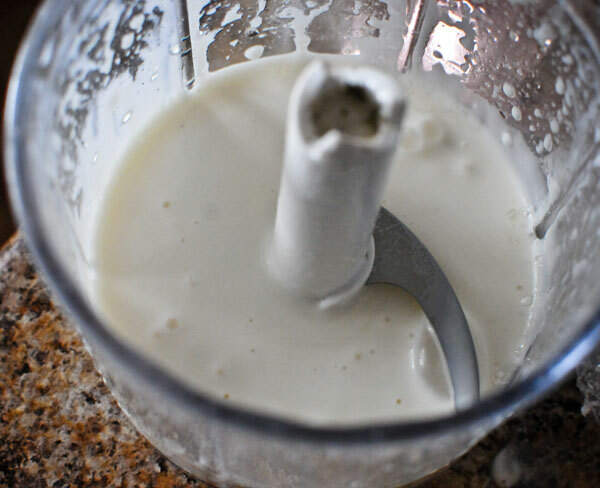 Blend again for another 10-15 seconds and taste – you made ranch dressing! I think as written this recipe has a slightly stronger garlic flavor than some ranch dressing, so you may want to start with half the amount of garlic and then add the rest to taste. The beauty of this is you can really season it to your exact specifications, it’s very customizable. So – are you a ranch person? Any other favorite dressings or sauces you use on everything? 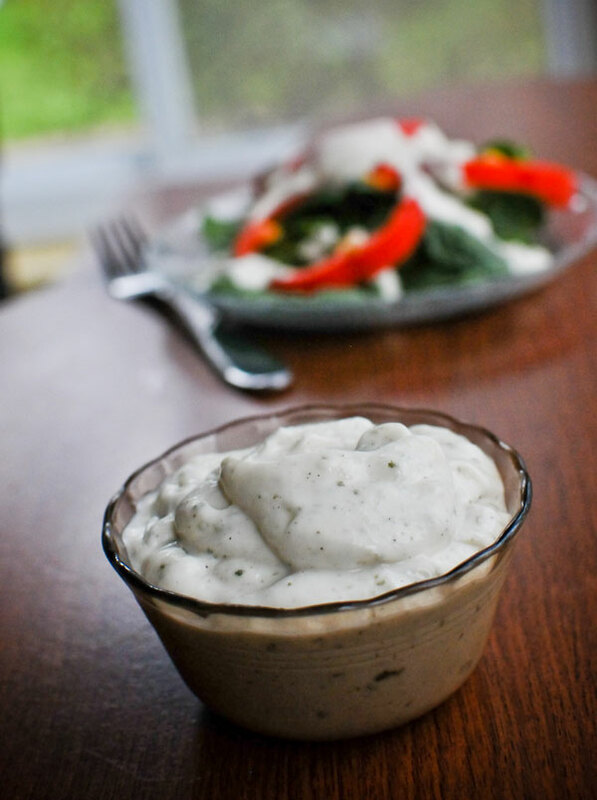 A creamy, delicious ranch dressing recipe. Egg free, dairy free, vegan, gluten free, soy free, refined sugar free. 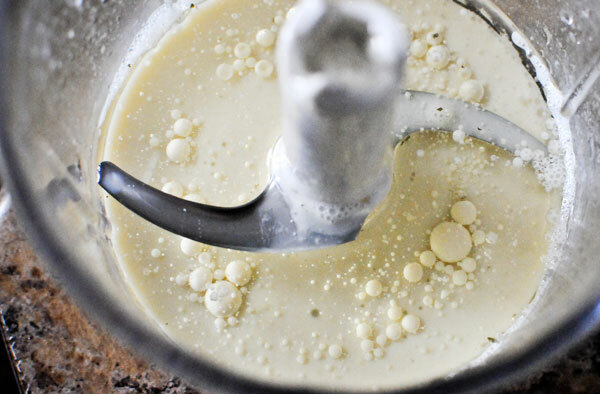 In a food processor or blender, combine oil and soymilk and blend for 10-15 seconds until creamy. Add lemon juice, garlic, onion, parsley, pepper, and salt and blend again for 10-15 seconds. Taste and serve, or keep covered in the fridge for a few days. You said “no soy” but then your recipe calls for soy…. You’re absolutely right – my mistake! I have changed the recipe to say that you can use hemp or rice milk as well, I looked into it and it works with those in addition to soy. Thanks for pointing that out! Thanks for the recipe! I can’t wait to try this one. Ranch seems to be the “everything” sauce of the South where I’m from. I never liked it much on salads, but loved to dip fries and veggies in it. Ok, I am officially adding you to my Google Reader! Two amazing recipes that are right up my alley — I like ranch as a dip so I will definitely give this a try! Wow, I love ranch dressing and this looks awesome! 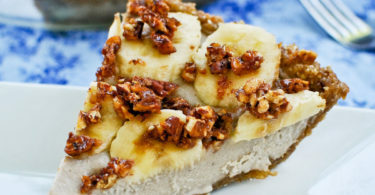 This could finally be the recipe that wins my kids over to the “vegan” side of life. Thanks so much…I can’t wait to try it!!! Thanks so much for posting this! I’ve been eating a ton of salad this summer and lately have been really craving ranch dressing. I went vegan a while back and didn’t think a non-dairy ranch was possible! 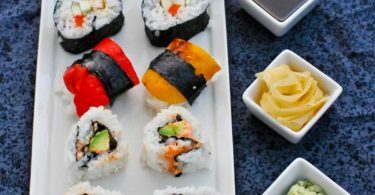 I’ve really enjoyed your site and can’t wait to try out some of your other recipes, not to mention start implementing your Greener Every Week ideas! Oh how I have missed ranch dressing since going “clean”! I will definitely be trying this! I don’t use canola oil though…what other oil do you think will work? How long does it take to thicken? I find grape seed oil to be a great alternative to canola! Do you think the Ranch dressing recipe would work with Almond Milk? Absolutely, but it might be thicker and will have a nuttier flavor! I just made this, and I love how quick this recipe is. I would have added dill but I was out of it, because the dill is what I remember most from my grandmother’s homemade ranch. I love recipes that take absolutely no effort but taste great. I stumbled on your blog via pinterest (I think!) and I made this ranch last night. I wasn’t sure I would like it at first, but I stuck it in the fridge, finished making dinner and when I pulled it out 15 minutes later it was like magic! All the flavors combined and I am now in ranch dressing heaven! THANK YOU! Helloo, this sounds delish! How long do you think a batch would last in the fridge? I’m guessing only a few days?? I made this ranch recipe with sweetened almond milk. It turned out great! OMG this is SUCH a great salad dressing! I also added chipotle peppers which makes it even better IMO. Thank you so much. This sounds like a great replacement for regular store-bought ranch dressing. 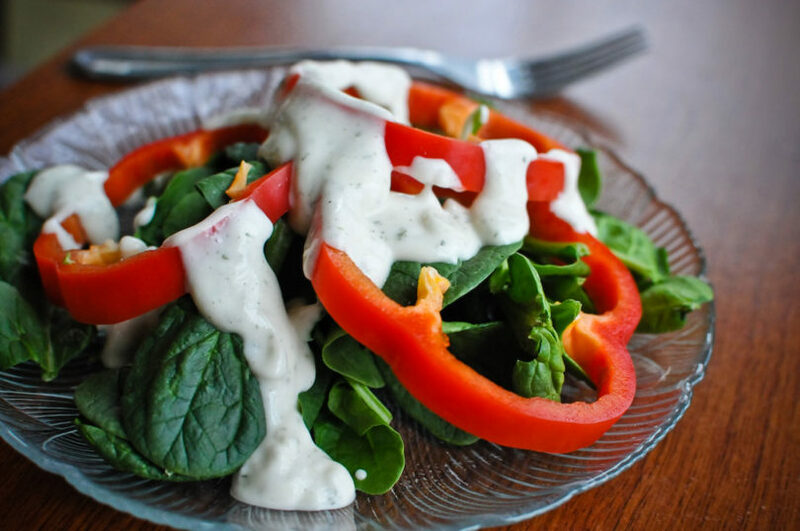 I don’t like eggs or milk, but I love the taste of ranch dressing on my fresh veggies, so this recipe sounds perfect for me. I can’t wait to try it! And this sounds easier to make than some other recipes I’ve found. Thanks again! I love rance but my body hates dairy, I definitly look forward to trying your ranch recipe. Have you ever thought of bottling it and selling it. Thanks! This stuff rocks!!! I used unsweetened plain almond milk and it was delicious. I only made a half portion because I was worried I wouldn’t like it…immediately wanted to go back and double it! It’s THAT good. How long will it stay fresh in the fridge? Wanted to pin this but couldn’t use the pictures in the pin so I guess I won’t pin it at all. That is too bad. When I went vegan, I never thought I’d have a good tasting ranch ever again. This recipe comes out perfect every time and it is so simple. I’ve tried it with fresh garlic and onion, lime juice, chipotle, dill…there is so much you can do to customize it, and it is delicious! I am very excited to try this recipe because it is one of the main foods I miss while being vegan. I was just wondering how many calories per serving and if there is any way to use less oil? This recipe was good, I used sweetened vanilla soy milk instead of plain, so it tasted kind of unusual, but very good with vegetables and even with chicken! Yeah, it really works best with soy milk and a really neutral oil like canola or safflower. Try it with soy milk, soy tends to work the best for this. Make sure to use a 2:1 ratio of oil to milk and if anything err on the side of slightly more oil. Hope that helps! I think the food processor also works better than the blender, and it’s important not to make too much or too little at a time – I find that 1/4 cup milk and 1/2 cup oil in a 3 or 4 cup food processor is best. First of all THANK YOU! I’ve been looking for a non-vinegar vegan salad dressing recipe and this fits and works. I made a half recipe with almond milk and oil but full lemon spices (except salt). I also added 1/2 tsp dill. It turned out great! Not real creamy, more like a creamy Italian dressing but the flavor is the best! I love it! [I make my own almond milk with one cup raw almonds (soaked in hot water, 1 tsp baking soda and 1 TBSP peroxide – to detoxify the non-organic pesticides for an hour) making about 5 cups of milk.] The only other slight change was using ground mixed pepper corns instead of just black pepper. Suggestion, if you try almond oil get the raw processed oil not the oil from roasted almonds which has a smell to it. If you can get past the smell or the roasted almond oil, it is still mild and great though.